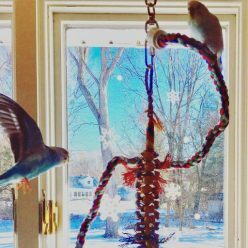 For me, setting up a home for our first parakeet had a fun sense of expectation, like Christmas Eve or a small slice of what it’s like for new parents setting up a nursery. The first thing you need is a cage – we chose the Prevue Pet Products 3352COCO Park Plaza Bird Cage, Coco Brown (seen above), which is a great quality cage with a lot of features, like the double-locking front door and bowl holders that swing out for easy feeding and watering. It worked out really well for socializing, as you can see in the picture. The seed catcher also helped minimize messes. Ultimately this cage did not work for Toby because she refused to go below the level the of the food cups, so instead of a 18″ x 18″ 49″ cage, he lived in a 18″ square block. 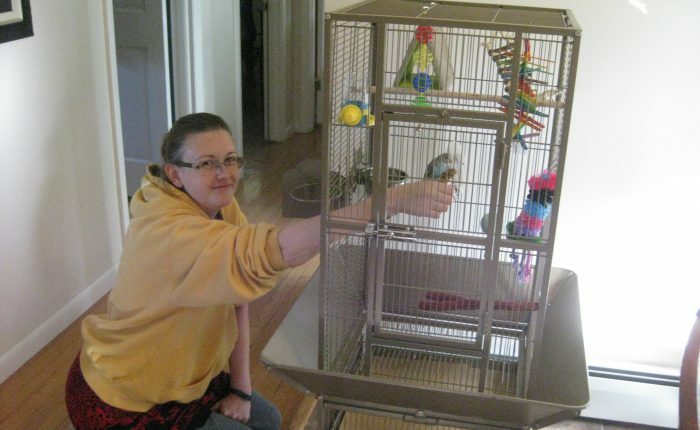 Our second parakeet, Kelly, also ended up living in this cage and it worked out much better for her. For the bottom of the cage, you can certainly line with newspaper but I really like Bird Cage Liners – Large Cages – Pick-Your-Size – 150 Count – 60 Pound Paper , they can catch a lot of liquid without anything seeping through (expect some water bowl spills), and it couldn’t be more convenient to take off the top sheet every day or so. You’ll want to get a supply of food, seeds or pellets are the main options, or some combination of the two. I’m planning a post solely on that issue, so my suggestion is to buy whatever your bird has been used to eating. The trauma of the move will throw him off enough, without trying to get him onto another food immediately. We have used all of those perches and they’ve worked out well for my parakeets. One thing to watch out for when buying perches or toys is the size. Many items are meant for larger parrots but it can be hard to tell, so always look at the dimensions and carefully read the descriptions. Your budgie will also need to start out with a few basic toys. They may come home without having learned to play with toys, but you can show them what to do easily. They learn very quickly and have a natural inclination to play. Toys are also critical for beak maintenance, preening instinct and satisfying the limitless drive to chew. When you’re setting everything up, keep in mind that depending on where your parakeet came from he may not know how to move around on the cage bars and he may not be able to fly depending on how his wings were clipped. So, have an eye towards making the cage easy to get around – the comfy perches are great for mobility, if you buy the longer perch it can create a flexible ramp leading to the food and water bowls and other toys and perches. Try to think about how your parakeet will move around the cage – you’ll be able to make adjustments once you have him home, of course, but it’s not always so easy when there’s a bird in the cage! Just a couple of items left, one is some type of Penn-Plax® Banana & Berry Cuttlebone & Mineral Block Combo for Birds, 2-Pack which they chew on to fill in on some gaps in their diet and also to keep their beaks in check. For socializing and treats you’ll want Kaytee Spray Millet for Birds, 12-Count , your parakeet may not know it right when he comes home, but this is his favorite treat. Finally Lixit Wide Mouth Bird Bottle, 10-Ounce , which is not a necessity and I would not recommend completely replacing a standard bowl of water, but it’s a nice addition. Both our parakeets strongly prefer drinking from the bottle versus the bowl. You do have to be vigilant about making sure they are in good working order, they can get stopped up easily. So, that’s all you need…except it’s really a pretty big investment. Your parakeet may cost approximately $25, but the start up gear can easily run $400-$500. On top of that, you’ll need (and want) to replace the toys and perches at a pretty steady rate. For my final note I wanted to give an estimate on what you can expect to spend monthly on your parakeet upkeep (not including start up costs) and I think it’s probably pretty close to $40-$50 – I like to have extra toys and perches on deck so I can switch things out when I think the keets are getting bored. My husband thinks I am on the very high end of reality, and believes we spend closer to $30 average per month, with some months much less. Toby and Kelly think we should stop worrying about it and just keep our wallets open! Related content: I finally worked up a real-world estimate of what getting prepared for your parakeet will cost. Spoiler alert: it’s not $500!